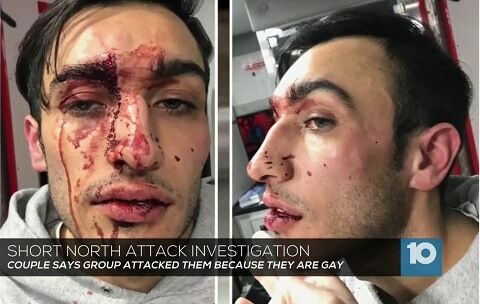 Two gay men in Columbus, Ohio were the alleged victims of a vicious hate crime last weekend. Bryson Beier and Mantej Sandhu (above), who had just moved to Columbus from California, say they were attacked by up to ten men early on Saturday morning in the Short North neighborhood. “I thought I was going to die. I thought for sure this was the end…they just started saying like ‘f****’ to us and stuff like that, and we were like what? And just kept walking. And they were like, ‘God hates f***. According to the couple, at this point a second car pulled up. Four or five men got out of the vehicle and joined in the assault. “I don’t know if it was like my own personal self-protection or what, but my vision went black and my brain just kind of shut down and I almost stopped feeling for a minute. Police are currently investigating and will consider whether to classify the attack as a hate crime.